New Killer Star (single edit, video). New Killer Star (Jonathan Ross, 2003). New Killer Star (Today Show, 2003). New Killer Star (France 2, 2003). New Killer Star (Late Show With David Letterman, 2003). New Killer Star (Last Call with Carson Daly, 2003). New Killer Star (A Reality Tour, 2003). New Killer Star (Die Harald Schmidt Show (@36:50 in), 2003). New Killer Star (Rove Live, 2004). New Killer Star (live, 2004). 17 March 2003: Walked around Battery Park at lunchtime. Tourists wearing Statue of Liberty headbands; two Ghanese men selling watches from suitcases; a strange lifelessness to everything. Walked through Castle Clinton, west to the shattered globe that used to stand in the plaza of the Trade Center. Went to a bar after work with D, H and G for a St. Patrick’s drink. “When we’ve taken out Hussein, we’re going to take out that guy in North Korea,” D said. But he didn’t want the NCAA tournament to begin only to have to be postponed. Instead of heading north, he walks down to Canal Street, with its scaffolds and traffic, men selling bootleg DVDs and CDs on blankets spread on the sidewalk (he spies a ChangesBowie, its cover art in the wan smear-colors of an aging printer; he considers buying it, realizes he has no cash). He takes Church Street. He picks up the old burning smell around the time he crosses Chambers and at Barclay he stops. Barriers fence barriers. Behind steel and aluminum grates ten or twenty feet high are long-necked cranes, a tortoise-like dump truck porting dirt around. People move in sagging lines, making lethargic pilgrimage. They take pictures of themselves and their friends in front of a construction site. Men in American-flag hats and bald eagle sweatshirts sell photographs of an exploding building. The words come soon enough. See the great white scar/over Battery Park… Or is it great white star? The bloodied earth or the place we dream of escaping to? A white scar is one that’s nearly healed, but the skin can lie. His friends call up to see if he’s ready to go out yet: I’m not better, he says. I’m not going to be better. He keeps a lost city in its head and every day he loses another piece of it. Was there ever a guy with a cobbler stand on Dey Street? Where were the non-fiction books in the Borders: upstairs or downstairs? Were there trees in the lobbies? What kind? How tall were they? What color were the walls of the Cortlandt St. station? Who but we remember these? No, we forget them, too. 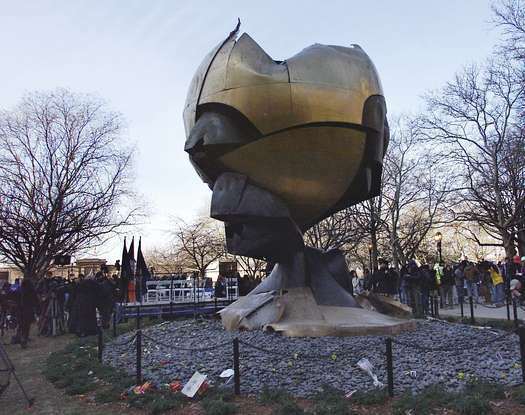 5 April 2003: It is strange–you wouldn’t know this conflict was raging from any walk through New York. Few conversations are about it; protests are generally small and confined. Some graffiti—Bush Is Hitler sort of thing. The war has become this sort of abstract, bad news from far away, like daily reports of a great forest fire somewhere. “New Killer Star” shares qualities of other “public” Bowie songs. The lyric’s run of sharp, disconnected details call back to the shell-shocked narrator of “Time Will Crawl“; its lyrical tone is a muted, older version of the raging, bewildered man who’s flipping through TV channels in “It’s No Game.” Only its first verse addresses a political “subject”: the empty bowl that once was the World Trade Center, the sutured hole in the ground. The rest of the song’s a man trying to distract and persuade himself by watching the skies, watching television, cottoning his memory with scenes from old films. So he winches up a routine. The song structure is the four-panel-grid of a comic strip (the bubbles and actions/the little details in color): establishing shot, start joke, build joke, punchline. So here: riff, verse, pre-chorus, two-part refrain (punchline: the title’s a British musician mocking the way the President of the United States pronounces “nuclear”). Eight-bar break. Repeat. The backing singers and the drums follow the same shifting patterns throughout, as if keeping to a map. The guitar/bass riff becomes the pre-chorus vocal melody (duh-DAH DAH, “I’m READ-Y”). In the refrains, the singers are replaced by a high keyboard line, then they’re called back in for the closer (cue tambourine). Do it twice and you’re out. The only variables in the mix are some thin, distorted, sometimes looped guitar atmospherics by David Torn, which sing through the track like telephone wires. I read someone a while back (blanking on the name) who said that Bowie should ideally lack nationality—that he was best as a Swiss resident, a man seemingly without a country or culture. But Bowie’s life in Switzerland was a set of lost, comfortable years. He’d been more alive as an artist when he was a Beckenhamite and a Londoner, when he was a Berliner, even a Los Angeleno. In Switzerland he’d been clean. He needed a city’s dirt in his blood again. So without even intending it, he’d become a New Yorker. By 2003, the only residence he owned was in the city. He’d raise his child there. He’s still pretty much there. So “New Killer Star” distilled a New Yorker’s emotional reaction to her city becoming the stage of a national tragedy, used as the justification for national retribution (which includes the torture report whose grotesque details have leaked on a slow drip the day I finished this piece). NYC was, and still is, disliked by much of its country. Two examples from my Nineties: a security guard at Dallas/Fort Worth Airport, asking me my final destination, then coldly shaking his head and saying “I’m very sorry to hear that.” A man in an Amtrak train bar car outside Philadelphia, asking me where I’m from, growing agitated, pushing into me. “I was in that city once and I did not like it. Me and that city do not get along.” There was a compact of sorts. People who lived in NYC were pitied but were generally left alone. There’s a David Johansen song written during the Guiliani years, in which Johansen complains that the old order—guys like him ranging around on the street, tourists on buses gawking at him—had started breaking down. They had started getting off the buses, he said. 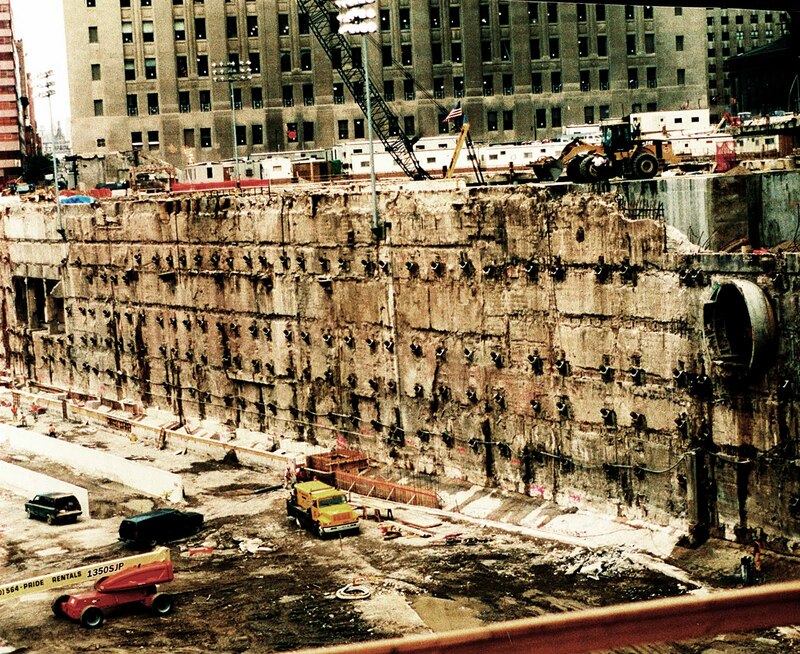 After 9/11, it got worse. 4 May 2003: We went to the Village Underground to see Hammell on Trial, a middle-aged bald man who swears a lot and punishes his acoustic guitar. “Where were the weapons of mass destruction?” he yelled. “A few guys in a tent with gasoline is not a weapon of mass destruction!” “What do you know, man?”: drunk voice in audience. 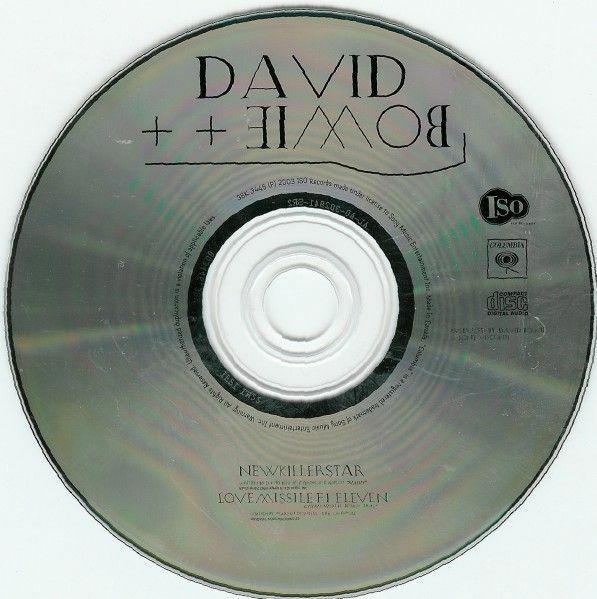 “New Killer Star” was a typical magpie construction for Bowie: its bass/guitar riff (in part by Tony Visconti, retained from the demos) was essentially the chorus hook of Little Peggy March’s “I Will Follow Him,” with a touch of Blur’s “Coffee and TV.” Nicholas Pegg noted how some of the song was lifted from “”87 and Cry,” from melodies to chorus hooks (and you realize how much the “disgraced” Never Let Me Down is resurfacing on this album). Recorded: (backing tracks) January-February 2003,(lead guitars, vocals, overdubs) March-May 2003, Looking Glass Studios. 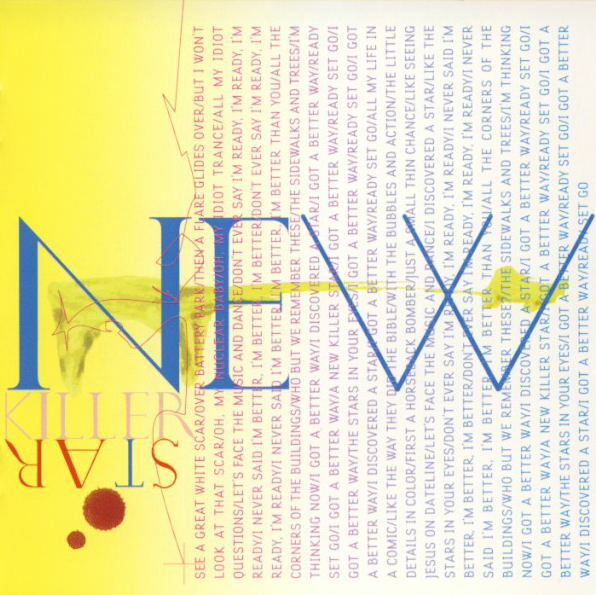 Released 16 September 2003 on Reality and as the album’s lead-off single on 29 September (the single edit, which trims intro and outro, appears on Nothing Has Changed): because it was released as a DVD single, “New Killer Star” didn’t qualify for singles charts, so it officially charted nowhere in the world). 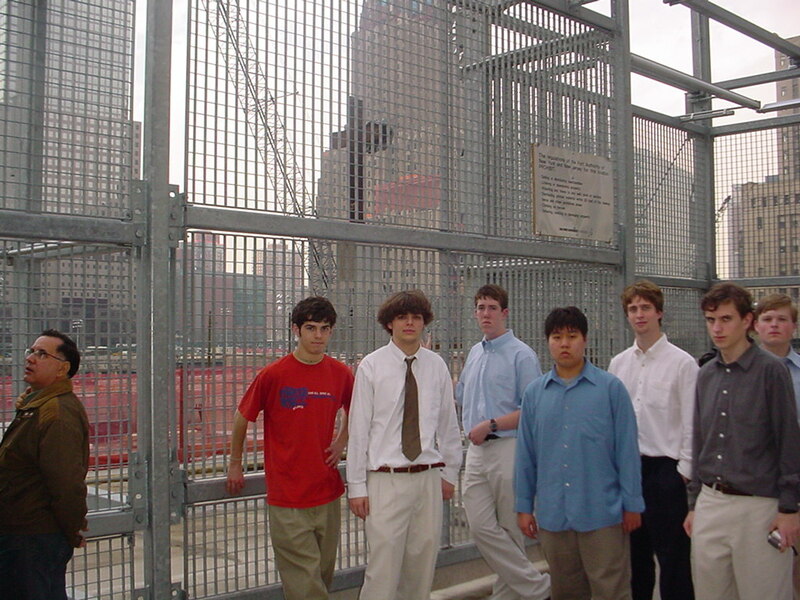 Top: Beth Keiser, “Fritz Koenig’s Sphere Dedicated in Battery Park,” March 2002; Joshua James Arcady, “Ground Zero” 9/11/02; Christian Brothers High School band visits Ground Zero, March 2003. All journal entries by me: NYC, 2003.